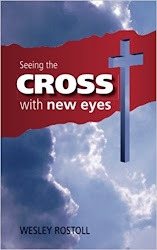 With new eyes: Why did God accept Abel's offering and not Cain's? Firstly, nowhere in Genesis does it suggest that Cain and Abel's offerings were sacrifices for sin, though Youngs Literal Translation has a clever word-play in verse 7 which warns Cain that should he not master his temptation it would lead to sin (this verse is directly linked to Genesis 3:16 as well by the way, check it out). Rather, it seems reasonable to me that both Cain and Abel brought their offerings to God as a sort of firstfruits-thanksgiving to the LORD. Later on, we see that grain offerings certainly had a place under the Law so I am not convinced that it was what Cain brought before God that made the LORD reject it. Secondly, it is highly doubtful that Abel actually killed an animal at all. It wasn't until after Noah's flood that God said that people could start eating animals so why would Abel think that God would like a good piece of steak? If Abel was a shepherd before people started eating meat then it's likely that he was in the business of producing milk and wool but certainly not lamb chops. As Jeremy Myers points out, the consonant for the Hebrew word for fat is the same as it is for the words milk and curds. So the most likely understanding would be that Abel's sacrifice was probably dairy related. That may sound strange to modern ears but it makes perfect sense if Abel the dairy farmer wants to dedicate the firstborn of his flock to God and offer up some of the produce. To further make my point consider what the Jewish historian Josephus wrote in Antiquities 1.2.1, “Cain brought the fruits of the earth, and of his husbandry; but Abel brought milk and the first-fruits of his flocks”. So if there was no blood involved in the offerings being made then why did God reject one and not the other? The author of Hebrews uses the story to make a point about faith (11:4) and Genesis itself uses the story to warn us against the dangers of entertaining jealousy and rivalry in our hearts. 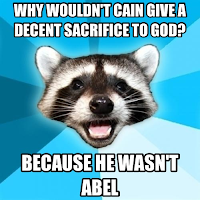 One must conclude though that the story simply does not attempt to answer the question of "Why Abel and not Cain?" directly at all though which should tell us that we are probably missing the point of the story if that question is our starting point. So what should we be looking for then over and above the example Cain provides of someone who fails to heed a warning from God? I believe that there is another reason why this story was included with certain details that is important to the bigger picture of the Bible. here is my thinking...Genesis 4 starts by pointing out that Eve first gave birth to Cain and then conceived again and gave birth to Abel. In ancient cultures, even those of the patriarchs, being the oldest kid came with all sorts of privileges, the oldest kid always got a double portion of the inheritance when the father passed away. The oldest was married off first and so on. But despite this tradition the pattern we see in the Bible does not stick with the program. God chose Isaac over Ishmael and the two have been at war ever since. Abraham blessed Ephraim over Manasseh, Jacob was blessed over Esau and their descendants fought tooth and nail for generation after generation. Jacob chose Rachel over Leah and the sisters sibling rivalry is documented in Genesis chapter 30. Joseph, the youngest of twelve brothers is chosen by God for great things and his brothers try to kill him before calming down and selling him into slavery instead. God chose Moses over Aaron. David, the youngest son of Jesse, is chosen to lead Israel, his family though thinks so little of him that they never even bothered inviting him to line up with his seven older brothers when Samuel was going to anoint one of them as king. David chose Solomon to succeed him rather than Adonijah before Solomon had Adonijah killed which you can read in 1 Kings 1:25. The Southern Kingdom, made up of Judah (youngest son of Leah) and Benjamin (youngest son of Rachel) follows God while the Northern Kingdom falls into captivity (eventually Judah falls as well). More politics and friction ensues in that story as well. It should be really obvious by this point that God accepting Abel over Cain is part of a much larger narrative which the Bible's authors were keen to point out. The firstborn, those with the inheritance and all of the authority had a way of getting pushed to the side in favour of the younger siblings. But with all the names mentioned above, if we go back chronologically we actually stopped one generation too early didn't we? What about Adam? What was his inheritance? What dominion and authority did he have? Did he blow it as well and is there a second Adam mentioned in scripture that stepped up in His place? Who does scripture reveal to be the true firstborn of all creation, even the firstfruits? I hope by now that you have the name Jesus on your lips. But there is more, Jesus is the end of this long and strange progression in scripture, better yet, He is the culmination of all the various images that we see in the Old Testament, the substance. Everything points toward Him. A new Adam in whom God is well pleased, a new Israel better than the first and a new covenant superior to what was prior. 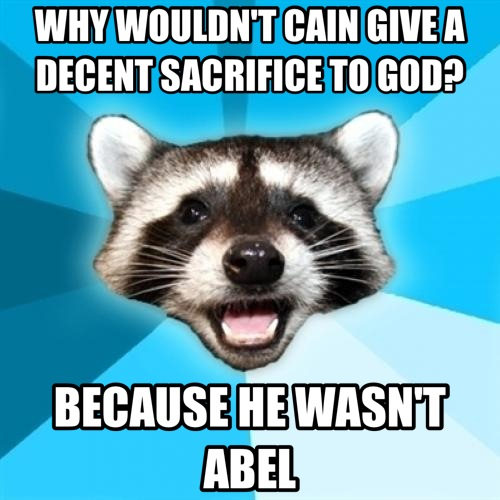 So why did God accept Abel's sacrifice and not Cain's? I'm not sure, though I'm pretty certain that the usual answers are inadequate. 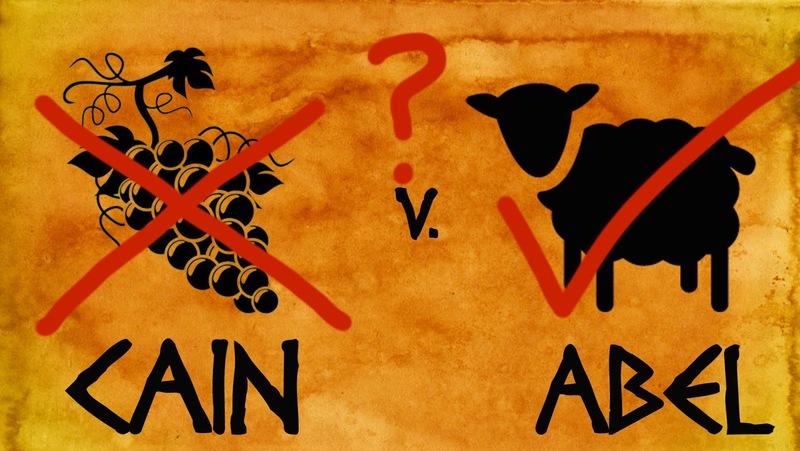 I don't think the Bible really is trying to answer that question for us anyhow, rather, a far better question to ask is what is the significance of God choosing Abel's offering over Cain's? That is what I have attempted to answer above. What we discover upon closer inspection is that the bigger picture leads us straight into a deeper revelation of Christ which the scriptures are keen to point out and that to me is a win! Yes, scripture is a collection of different stories and different books but they are also part of one larger story pointing us to Jesus. This post was part of a monthly Synchroblog, be sure to check out what other people wrote about on the links below.